Obviously my first love of weddings is the photography – but my second favorite part about weddings is the cake! Here are some of, in my opinion, the best wedding cakes in Maine. I hope these are helpful to you when planning your big day! Known as the “wedding cake professionals” – Cakes Extraordinaire can turn any photo you take into the wedding cake of your dreams. Not to mention – their wide array of flavor combinations will make you want more before you even take a bite! This company is definitely one of the best wedding cake bakers in Maine. 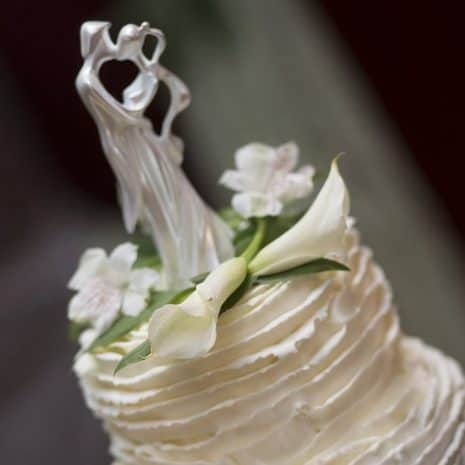 If delicious and delectable wedding cake is your thing – but so is buying local and being eco-friendly – then Beach Pea Baking Company is your wedding cake match! Not only are their cakes amazing but they support local farmers and use vendors who use sustainable, and use eco – friendly practices. Not only do I love this place because of its “punny name” – I love it because if you can think of it (or find a photo of it) – they can make it for you! The name may sound simple – but their cakes are far from it! Even offering gluten free cakes, you can get the “down home” feel mixed with classy elegance at this bakery. Not to mention – the taste is unforgettable! If you’re looking for fresh cakes and sweets made just for you – or trying to find something that no one else seems to be able to know about – then you should ask Hillary – aka as the Camden Cake Lady. She can make it for you any way you like it. Your guests will leave raving about it too. The Camden Cake Lady is without a doubt one of the best wedding cake bakers in Maine. Focusing on specialty wedding cakes – Let Them Eat Cake is where to go if you want an award winning cake that tastes good too! Picking out cakes can be so fun, I hope this helps sway you in some yummy directions. To book your wedding photographer contact me! What a great post! I too LOVE wedding cake! But it has to taste phenomenal! It does not matter if it is just pretty, if those calories are going in my mouth, they have to be worth it! What a great resource! What a great post. I love seeing all the different wedding cakes at weddings. Super helpful post for those living in Maine! Now you’ve got me craving cake ! Thank you for sharing! I love cakes so much!